One of her clients said: "Having Susan as my vet has given me great piece of mind as i have a dog that has always been sickly, with her help my dogs life is now back to a better quality than ever! She truly is a blessing to the veterinary world!" Doc Susan Roberts has give Jet and myself advice in so many different occasion and in all the times she has be spot on in her ways. Such a beautiful, passionate doctor who cares so much about each animal. 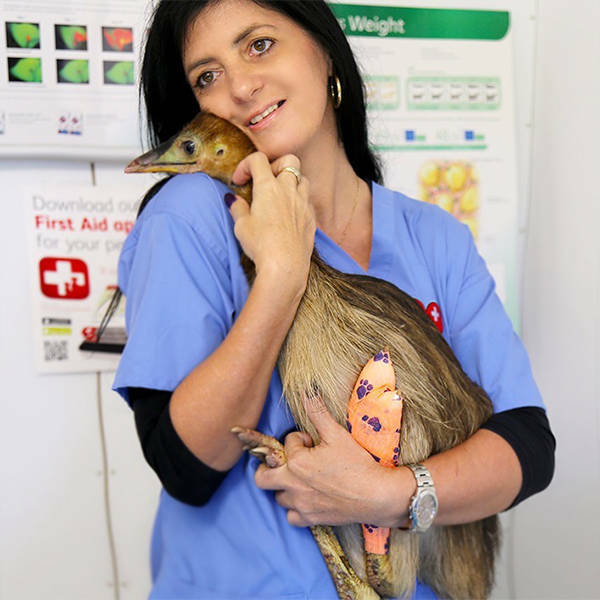 Susan is a dedicated vet, often fostering animals at her home after they have been handed in. There is no off switch with Susan she is always available, the animals come first. She has traveled to many countries and looked after manner of animals. Very Bondi vet worthy. Totally dedicated vet with very a interesting history. She has worked with orangutans in Borneo, and all sorts of animals in Hong Kong. She rehabilitates loads of native animals here. I hope she wins because I think her practice would make for interesting viewing. Very hard working.She seems to never take time off! I look forward to reading about all the cute and fuzzies on the facebook page so I cant wait to watch this on TV! This vet deserves to win this more than anyone I know! So hardworking and dedicated. She is always there when we need her. I will vote for her and I would love to see her win!